3D printing, frequently called rapid prototyping or additive manufacturing, is a manufacturing process that permits computer generated 3D models to be transformed into physical objects through a layered printing process. 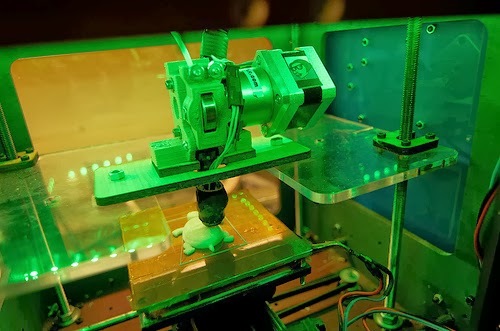 The systems were initially invented in the 90s as a way to produce relatively inexpensive prototype parts for industrial and automotive design work, however as costs begin to fall, 3D printing is finding its way into an expanding variety of industries. Although there are a few different 3D printing methods, the basic procedure is pretty regular from one to the next. In additive manufacturing, three-dimensional objects are produced using raw material in either liquid or particle form. A 3D printer deposits microscopically thin layers of the raw material, and the print gradually materializes as the layers are built up step by step. What are the applications for 3D printing? The classic application for 3D printing has traditionally been rapid prototyping in mechanical and automotive design settings. 3D printing makes it quick and economical to produce concept models, and perform fit & functionality tests. The technology equipment has even progress to the point where it is possible to print small quantities of production quality parts. - Fine art: like Jewellery and sculpture, etc. - Selling/Entertainment: Figures, toys, etc. - Geospatial: Geographic or topological models can be produced directly from raw GIS data. - Architectural visualization: Pre-viz models can be produced quickly and inexpensively. Can I have my own models printed? This is probably one of the greatest improvements of 3D printing compare to the traditional engineering techniques: the cost per unit is the same whether you print one copy or one hundred. Another important gain of in-house 3D printing is in regards of the safety of intellectual property. In today’s competitive market, a leaked design may be a lost opportunity, making it imperative that companies ensure absolute confidentiality for their designs. Whenever detailed designs are sent beyond the company network and outside the company’s physical premises, a potential risk is involved. Keeping rapid prototyping in-house, with a 3D printer, excludes the need to transmit design files to any external network. It ensures that designs never leave the company premises, and intellectual property is better protected. Regardless of how a prototype is produced, the goal is to accurately simulate the real-life product. In every field, high-quality, precise models are vital for fit, form and function testing. -Manufacturing complexity is free. In traditional manufacturing, the more complicated an object’s shape, the more it costs to make it. On a 3D printer, complexity costs are the same as simplicity costs. - Zero lead-time. A 3D printer can print on demand when an object is needed minimizing the costs of long-distances shipping. -Zero skill manufacturing. Mass production and computer-guided manufacturing machines diminish the need for high-skilled production. -Variety is free. A single 3D printer can make many shapes. You don’t have to spend unlimited amounts of money, these machines are much more versatile than the traditional. -No assembly required. This will shorten the supply chain, save money on labor and transportation and as a consequence the pollution will be reduced. Laura is originally from Barcelona, Spain; she is currently living in London, where she moved two years ago to start a Marketing career. She likes being updated about design and decoration trends. She is currently blogging for http://www.vizabilitylondon.com/ about printing and design.